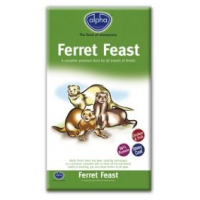 Alpha Ferret Feast is a perfectly complete, balanced food that has been expertly formulated to meet the specific nutritional requirements of ferrets. This premium food acknowledges the specific dietary requirements of ferrets and offers a high proportion of poultry and fish meal; both offering a high-quality source of meat protein. Packed full of essential vitamins and minerals, Alpha Ferret Feast provides ferrets with everything they need to remain fit and healthy. Unlike other foods, Ferret Feast does not carry the strong odour commonly associated with ferret food.